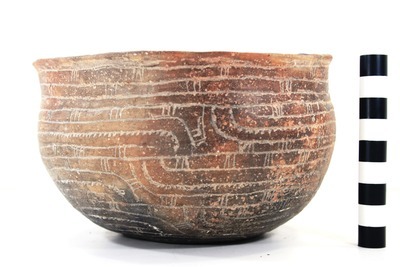 "41HS261, 2003.08.107, Burial 4, Vessel 8" by Timothy K. Perttula and Robert Z. Selden Jr.
DECORATION (INCLUDING MOTIF AND ELEMENTS WHEN APPARENT): The rim has three horizontal engraved lines with sets of three vertical engraved lines around the vessel. The vessel body has four stacked horizontal and curvilinear engraved scrolls with excised pendant triangles along the scroll line; these scrolls extend to the vessel base. The engraved scroll motifs are divided by brackets with sets of three or four diagonal engraved lines in the central part of the brackets. The upper and lower scroll fill zones have sets of three vertical engraved lines (see also Jones 1968:Plate 24f-f’). Natchitoches Engraved carinated bowl, Burial 4, Vessel No. 8, J. O. and Henry Brown site.